Flexible is something media companies are not. There are abundant demonstrations, but nowhere as identifiable as in the radio industry where the same approach to producing the same type audio - for listeners and advertisers - has been used over 40 years. Radio's current programming basics were developed around the time of Marshall McLuhan's declaration "The media is the message." Curiously, if the media is the message, what message comes from a stagnated media? Audio Graphics has been online since 1997. It's been involved with many firsts and failures, because you don't keep pace with change and not feel the results of both. Current trends have podcasting as the money word. As with radio's involvement in couponing, HD Radio, poorly constructed web sites, social media, and other digital assets, I'll again say that there isn't enough human resource or technical knowledge in the radio industry to make its dive into this current buzzword - "podcasts" - profitable. Though, "new" approaches to audio content construction and distribution are needed, podcasting is not new. Nor is it successful, beyond a handful of titles continuously repeated by persons pushing podcasts as radio's new path. There aren't enough talented people left in the business to produce content for the current depth of podcast topics. Here's my solution, which 1) helps expose quality indie artists who can't get exposure on big corporate channels; 2) gives free music to radio stations, in the shadow of recently changed royalty rates. RRadio Music artists sign a waiver giving use of their music in exchange for exposure. I believe the media is the message, with Audio Graphics' message being its RRadio Music players. This media is not built on specific-length programs (half-hour, hour, etc), similar music parsed by genre, and desires for hearing a host (or not). The key: RRadio Music player music is free for radio stations. There are no copyright, performance, or other fees for radio's use of these songs. RRadio Music players are a hybrid of podcast and on demand, featuring "Music Shorts," a quick collection of songs from either a specific genre or a mashed mix. Our audience may also select an "Intro to Indie Artists" host-delivered 5, 3, or 2 song program. (Many get all three.) A single RRadio Music player may contain one song or hours of them. 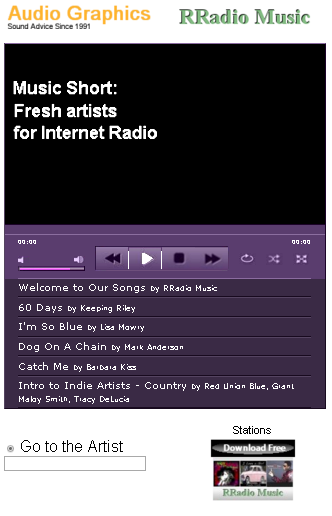 Radio programmers wanting to add single song to their playlist use RRadio Music. "Music Shorts" is in soft launch, gaining steam in all sectors. For stations looking to add free music, and artists wishing to reach a larger audience, RRadio Music satisfies both groups' needs. Good, new music from a variety of fresh artists. That's the message in the media I work in. Give "Live For The Money Today" a listen.